We were offered the opportunity to get involved in championing the then new 5 Star Charitable Trust back in September 2013, and they grabbed it with both hands and very quickly had worthy causes interested in submitting a bid for funding. 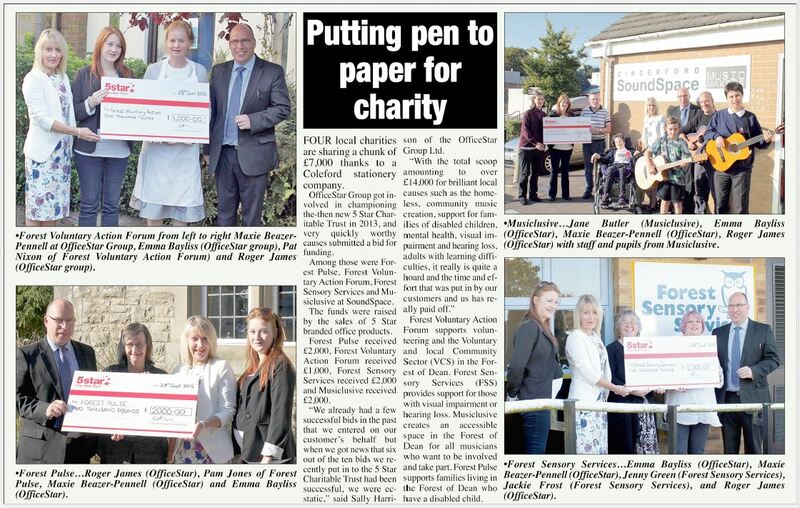 The funds that are donated by the 5 Star Charitable Trust are raised by the sales of 5 Star branded office products , so the more that the OfficeStar Group sell, the more there is to donate to local charities and worthy causes, which is a win win situation. We already had a few successful bids in the past that we entered on our customers behalf but when we got news that six out of the ten bids we recently put in to the 5 Star Charitable Trust had been successful, we were ecstatic ! With the total scoop amounting to over £14,000 for brilliant local causes such as the homeless, community music creation, support for families of disabled children, mental health, visual impairment and hearing loss, adults with learning difficulties, it really is quite a hoard and the time and effort that was put in by our customers and us has really paid off. If you would like to support the 5 Star Charitable Trust please ensure you purchase the 5 Star Brand of office stationery . The OfficeStar Group welcomes applications from local customers who are interested in applying for funding.